of matching size and conformation, shown standing in different lively attitudes, with short-cropped manes, wide forelocks and docked tails, caparisoned with matching leaf-shaped blue-glazed pendants on their chests, bridles and crupper-straps; the white-glazed horse shown with head slightly bowed and turned sharply to the left, fitted with a saddle blanket splash-glazed in blue, green and russet under a saddle covered with a knotted cloth glazed in russet, the translucent glaze on the body showing faint iridescence and a finely crackled surface; the russet-glazed horse shown with head held up and turned slightly to the left, fitted with a saddle covered by a pleated cloth glazed bright blue over a saddle blanket splash-glazed in russet, green and cream-white and with blue-glazed straps hanging over the back, the russet glaze on the body of the horse liberally applied, running over the hooves and onto the base. During the Sui and Tang periods horses were frequently imported from regions west of China such as Ferghana and Bactria, and these foreign-bred horses imported on the 'Silk Road' were renowned for their superior stamina and size. These horses were primarily imported for military use, but were also used by the Tang nobility for hunting and other pastimes such as polo. A similarly modelled white-glazed pottery horse of this size with blue and sancai-glazed trappings from the Avery Brundage Collection is illustrated by Hei Li in Chinese Ceramics: The New Standard Guide from the Asian Art Museum of San Francisco, London, 1996, p. 99, no. 173. An amber-glazed pottery horse of this size and related type, but more simply modelled, from the Calmann Collection now in the Musée Guimet, is illustrated in the catalogue entitled Chine: des chevaux et des hommes, Musée National des Arts asiatiques – Guimet, Paris, 1995-1996, p. 166, no. 65. 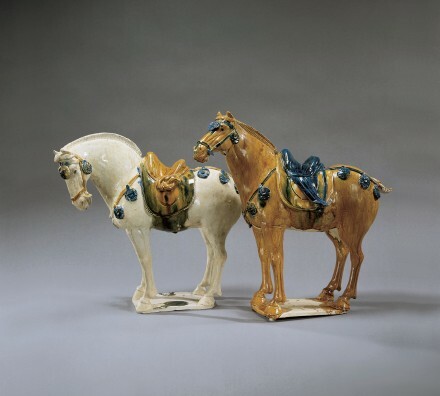 Compare also the slightly larger white-glazed horse of related type with blue and sancai-glazed trappings in the Beijing Palace Museum, illustrated by Wango Weng and Yang Boda, The Palace Museum: Peking, New York, 1982, p. 245, pl. 141.